Games and puzzles provide challenging and interesting opportunities for exercising problem-solving skills. Before looking at the underlying mathematics, the game must be learned to be enjoyed or, the puzzle solved. 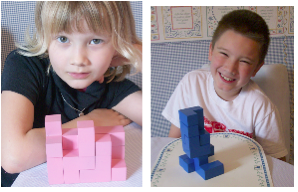 My favorite math puzzle is a seven-piece set of puzzle parts formed by gluing identical cubes face-to-face. Six of the puzzle pieces are made by gluing four cubes. 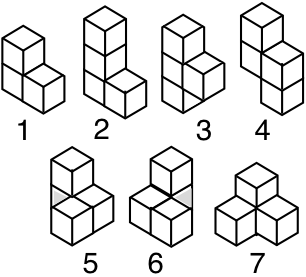 The seventh piece is made of three cubes. The 27 cubes of the 7 puzzle pieces will fit together to form a 3 X 3 X 3 cube. Not counting rotations, there are 240 distinct ways to build the 3 X 3 X 3 cube. Finding just one of them can be a real challenge. The seven pieces are not just chosen at random. They are pieced together according to a precise mathematical rule. I first learned of this puzzle from one of Martin Gardner’s Mathematical Games columns in Scientific American magazine. The puzzle is called Soma and he credits its invention to Piet Hein (1905–1996), a Danish architect, poet, and inventor. John Horton Conway, one of our treasured living mathematicians, spent a wet and windy afternoon mapping all of the possible solutions, that are unique, for forming the cube. If you would like to know more about the history of Soma and the rule directing the construction of the seven pieces, just send a request to grandadscience@gmail.com. In these pictures, Jordann and Joshua concentrate on building the cube. Notice, I made a pink set for Jordann and a blue set for Joshua. If I had it to do over, I would have let the kids glue and paint their own sets. Check out this video to see one of the possible solutions. Building a 3 X 3 X 3 cube is only one of numerous structures that can be built from the seven pieces. Jordann built a castle and Joshua built a tower. Their structures becomes problems for grandad to solve. Many of you grandads will simply go to your shop and make a set of 27 cubes. If you prefer, you can order a set of 100 one-inch wooden cubes from EAI Education for $11 plus shipping. Here is the link http://www.eaieducation.com/531012.html and phone number 1-800-770-8010. In a later post, I will show you how to build a puzzle that explores cannonball numbers, which are 3-dimensional figurate numbers.